Intermediate public transport services such as auto-rickshaws are an important part of sustainable urban transport in India. Photo by Roy Sinai. This blog post is part of the Catalyzing New Mobility program and receives support from The Rockefeller Foundation. Intermediate public transport (IPT) services, such as auto-rickshaws and taxis are an important part of sustainable urban transport in India. Over the past few years, EMBARQ India has undertaken several activities to promote IPT services in Indian cities. These activities can be broadly categorized into research and publications; city-level demonstration projects; policy reforms; capacity building; and knowledge-sharing and information exchange. 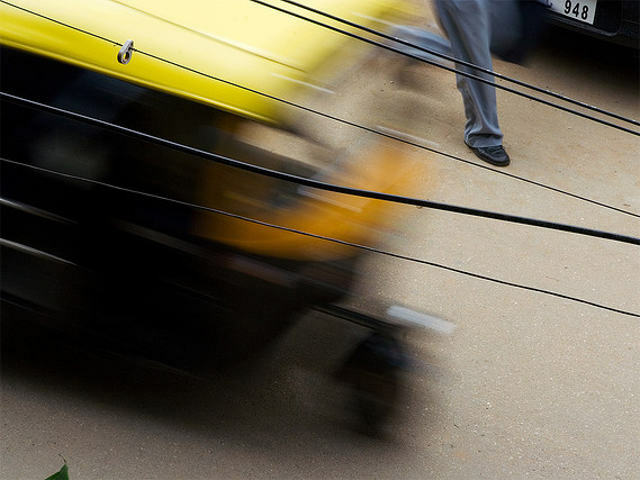 As part of the knowledge-sharing and information exchange activities, EMBARQ India created an online discussion forum in April 2012, titled the Rickshaw Taxi Discussion Group. Its aims is to bring together a diverse group of professionals, in India as well as internationally, who are interested in sharing ideas, asking questions, and debating a wide range of issues affecting auto-rickshaw and taxi services, such as policy and regulation, economics and finance, entrepreneurship, technology applications, environmental impacts, vehicle design, and road safety. Over the course of the past year, the group has grown to comprise more than 100 members from various backgrounds, including government, civil society, academicians and researchers, entrepreneurs, investors, industry associations, and major manufacturers. On its one-year anniversary, we briefly highlight some of the key discussions that have ensued in the group and some ideas on the way forward to enable the group to achieve its intended objectives. The group members have discussed and deliberated on a range of topics, primarily in the areas of policy and regulation, and entrepreneurship. These are briefly discussed below. Fare policy for auto-rickshaws was one of the most important topics of discussion, reflecting both the importance of this aspect in the regulation of auto-rickshaw services, as well as the need for many cities across India to address current challenges regarding auto-rickshaw fares. The discussions focused primarily on the fare policy work of the Hakim Committee (a one-man committee set-up by the state government of Maharashtra to devise auto-rickshaw and taxi fare policy for Mumbai and other cities in the state), addressing what other cities in India learn from this initiative. These discussions led to insights on key input factors (costs and operating characteristics) to be considered for fare-setting, formulas for fare estimation, and the need for undertaking fare revisions on a regular basis to reflect changes in input costs. The importance of stakeholder engagement, as well as public outreach, was also emphasized as a critical component in the fare policy reform effort. Closed permit policies in cities, where there is a regulatory cap on the number of permits, often lead to permit trading and a significant increase in permit costs, which impact driver economics. Closed permit policies also typically lead to an under-supply of service — a major reason for the poor quality of service for passengers (characteristic of a seller’s market). Cities need to rethink their current permit policy frameworks, so that issues such as under-supply, high permit costs, and lack of transparency in permit ownership, can be addressed for the overall improvement of the sector. There have been many initiatives across cities aiming to organize the currently unorganized auto-rickshaw sector into fleet-based services. The group discussions have enabled expert insights, as well as peer-to-peer learning, between initiatives in different cities, in subject areas such as regulatory barriers, which need to be eliminated to promote such initiatives, and avenues for access to finance for entrepreneurs to scale-up their businesses. Innovations in the area of electric auto-rickshaws and taxis were discussed, with insights on the factors that could make electric vehicles a viable option in the future (such as economics and favorable government policies), while addressing some of the complexities of large-scale deployment of electric vehicle fleet, including charging infrastructure, charging time, as well as after-sales support and maintenance of fleet. The discussions also shed light on some of the other areas of entrepreneurial activity in the sector, including smartphone applications for hailing auto-rickshaws and taxis; technology applications for vehicle and fare tracking; and ride-sharing services (i.e. carpooling and cab-pooling). The Rickshaw Taxi Discussion Group serves as a useful platform to bring together a diverse group of professionals (both organizationally and geographically), who are interested in sharing thoughts, ideas and insights on auto-rickshaw and taxi services. These discussions are enabling the members to learn about case studies from different cities in India (as well as internationally), assess regulatory implications, appreciate the innovations taking place in the sector, and identify the role of various industry stakeholders (such as regulators, civil society, and the private sector) to promote reforms. The discussions have made it clear that there are many challenges facing the sector in Indian cities, but the opportunities for reforms are significant, which would provide benefits for drivers, passengers, and cities as a whole. The group, through its discussions, hopes to serve as an important knowledge exchange platform, to help bring auto-rickshaw and taxi issues in the spotlight. If you are interested in joining the group, please write to Akshay Mani, Project Manager for Urban Transport at EMBARQ India, at amani@embarqindia.org. We look forward to your participation. Can auto-rickshaw fare reform in Chennai lead users to choose sustainable transport?